On the back of the pattern envelope you will see a chart that has size measurements (these are your body measurements), as well as one that has finished measurements. After taking your own full bust measurement, compare that to the size measurement to see where you fall. For instance, my bust is 34ʺ, which puts me at a small. However, the Cottage has a very loose silhouette and includes a lot of design ease. Design ease is the extra fullness added to a garment to create the silhouette. To calculate design ease, take the finished measurement and subtract your actual bust measurement. You may want less design ease and choose to make one size smaller. For my frame, it is a little too much, so I decided to simply make the XS instead of the S. If you prefer even more ease, you can make a larger size. 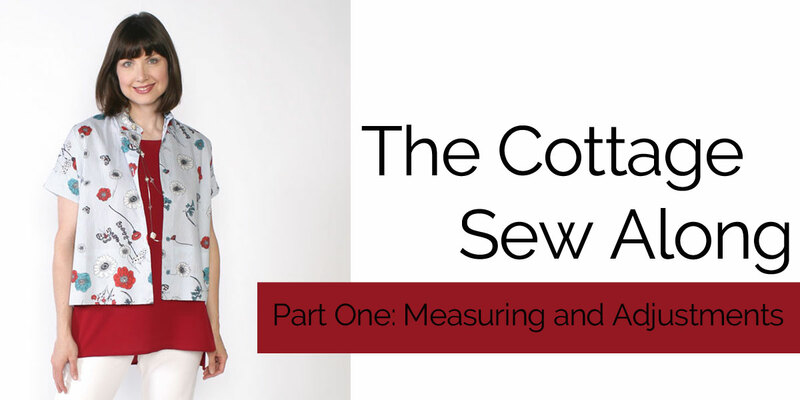 Looking at the finished measurements and calculating design ease can really help you understand how a garment is going to fit you. ​Before cutting your fabric, it is important to establish the straight of grain. As Linda says, this is one of the most important but often the most skipped step of the garment-sewing process. It is vital that the pattern is cut on the straight grain of the fabric because this will keep your project from stretching out of shape or not hanging correctly. To find the straight of grain, snip into the fabric along one selvage edge and either tear across the crossgrain (or the weft of the fabric) or pull a thread across the width and cut along the loosened thread line. This will give you a straight edge where the warp and weft grains are at a 90 degree angle. Once your pattern pieces are cut, mark all your notches and dots immediately. I start by snipping into my notches, as opposed to cutting triangles that protrude out. ​Place pin through the point you want to mark. Gently separate the pattern tissue from the fabric. Using a contrasting color, take a single stitch where the pin enters the fabric, leaving a 1ʺ thread tail. Complete the stitch loop. Cut thread leaving another long tail. A technique that we use in many of our patterns, including in the Cottage construction, is the use of pressing templates. Start by making your own template using a manila file folder or tagboard of similar weight. For the Cottage, you will cut one template in the following size: 1¼" wide by 11½" long. This method will be used on the center front doublefold hem. Use the following method to press with the templates. For the first fold, place the template on the wrong side of the hem edge. Press the hem up and over the template, matching the raw edge of the fabric to the top of the template. Press. Keeping the first fold pressed in place, repeat above to press the second fold. ​Now it's time to check your sewing tools. Test your needle, thread and fabric combination. We recommend 100% silk-finish cotton thread on wovens. Start your project with a new needle. I am using a Universal 75/10 needle. But that is what works with my fabric/thread/machine combination. Test your combination first. This will help resolve any stitching issues before you begin your project. Having the right tools will increase your sewing success. Here are tools that I found helped when I made my Frankie shirt. Fusi-Web – This is really a must-have in your sewing tool-kit. Glass Head Pins – My personal favorite pins. Tailor's Ham – If you are a garment sewer, you should have this in your toolbox – no excuses. Seam Roll – A huge help when constructing the collar. Tailoring Board – See all those crazy curves and points? They will help you get into all the nooks and crannies of collars, sleeves, etc. and it holds your tailor's ham! Sleeve Board – This makes working on sleeves and cuffs so much easier.